Today I thought it would be good to talk about the one part of a wedding few people enjoy. Yes, you’ve guessed it – Group Photos. 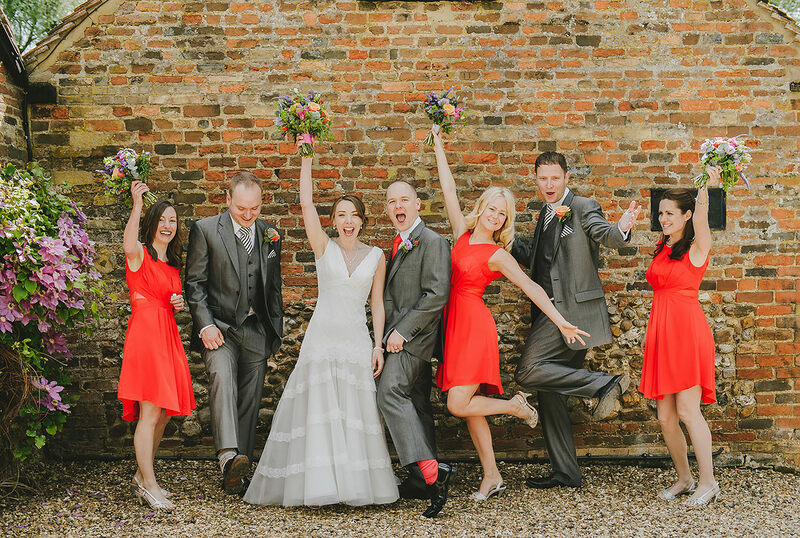 Let’s face it, you’ve probably been to a wedding or two where you’ve found yourselves roped into endless formal photos which seem to take over the entire wedding reception. It’s a real shame when group photos become a chore like this, especially as these pictures should bring back happy memories rather than remind you of all the canapes and drinks you missed out on. But there is good news… group photos can be done quickly and cheerfully. Today I’d like to share a few ideas about how you can make them simple, fast and fun. Chances are you won’t want to devote more than 30 minutes of your wedding day to formal group photos. With all the buzz and excitement you’d probably rather be meeting and greeting your guests and sampling some canapes rather than be stuck to one spot for endless photos. So when it comes to planning your day take some time to look at your schedule and think about where the photos will fit in. Usually it will take anything between 3 to 5 minutes to gather, arrange and shoot just one group photo, so work out how much time you want to spend on these shots whilst also considering how your couple shots will fit in. You may even want to scatter your groups throughout the day, capturing the all important family photos during your reception and perhaps some less formal shots in the morning or evening. Remember what style of photography you booked your photographer for and ensure they have long enough to capture the kind of photos you really want. For some couples this might mean making more time for formal photos, for others it may mean keeping them short and sweet so your photographer can get creative and capture the atmosphere of your wedding day. If you have a large family and there is no way round having multiple group photos perhaps consider booking a Second Shooter so you don’t miss out on these shots when time is tight. Choosing your Group Photos is a very personal decision and it’s not always an easy one. Do you want dedicated pictures with extended family or would you prefer more focus on your immediate families? Could you include everyone in one big group photo instead of having multiple setups? Ultimately one size simply doesn’t fit all when it comes to wedding photography, so while I generally suggest couples aim for a maximum of 10 group photos this isn’t always possible. Start by prioritising your ‘must have’ groups and take it from there. 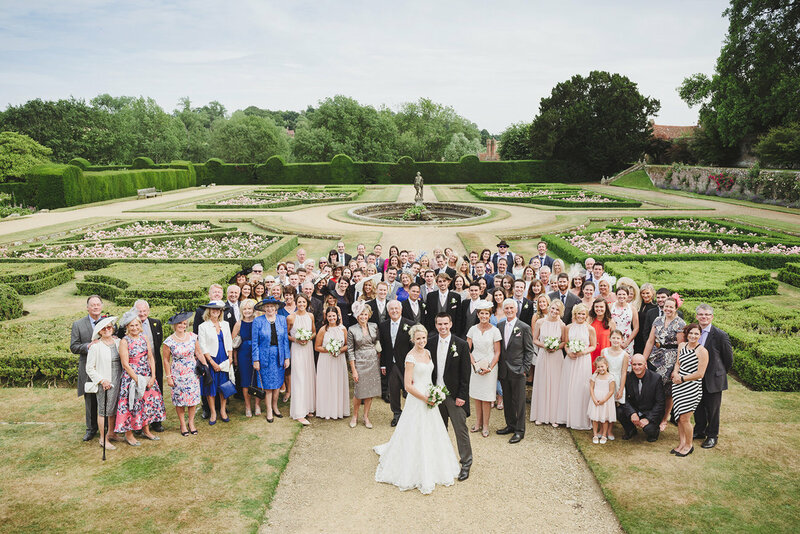 It could be having one big group photo is the perfect solution for you if you’d like to have all your guests in at least one setup photo, but don’t want to spend hours on multiple shots. 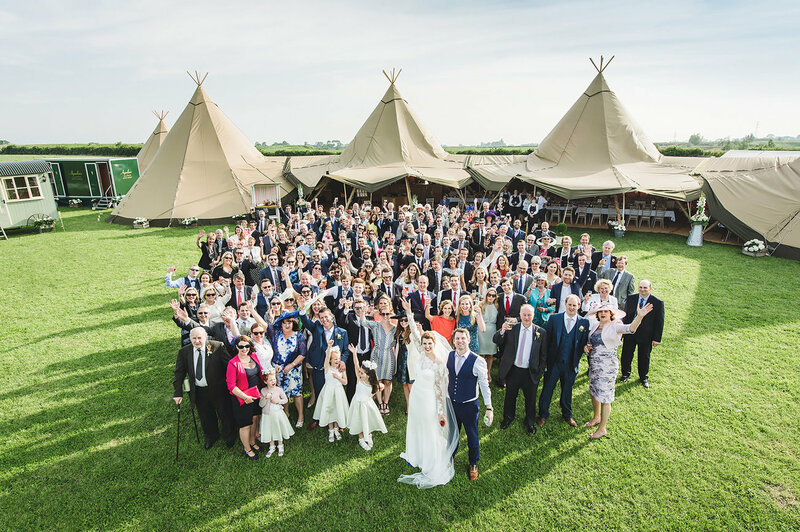 For this to work it’s important your venue has some height or shaded steps available to your photographer as it’s not always possible to photograph large groups at eye-level. Personally I’m always happy to climb a ladder if your venue doesn’t have a high vantage point, just check your venue has one spare. If this idea appeals try to fit it in with a time when your guests are naturally grouped together so you don’t break up the party, usually I’ll do this just before the wedding breakfast or immediately after the ceremony ends. I can’t emphasise this one enough. 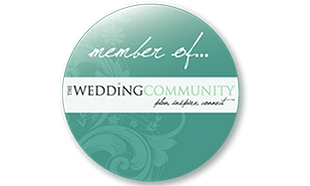 While your wedding photographer can help gather your guests together things will run far more smoothly if you have a few nominated ‘helpers’ to hand. In all likelihood your guests will be dotted around the venue so it’s incredibly handy to have a few ushers or family members get them moving while your photographer sets up the initial shots. Its so much easier when guests can step in and out of photos like clockwork. Once you’ve decided on your groups and who is going to help gather them make sure everybody knows what to expect. 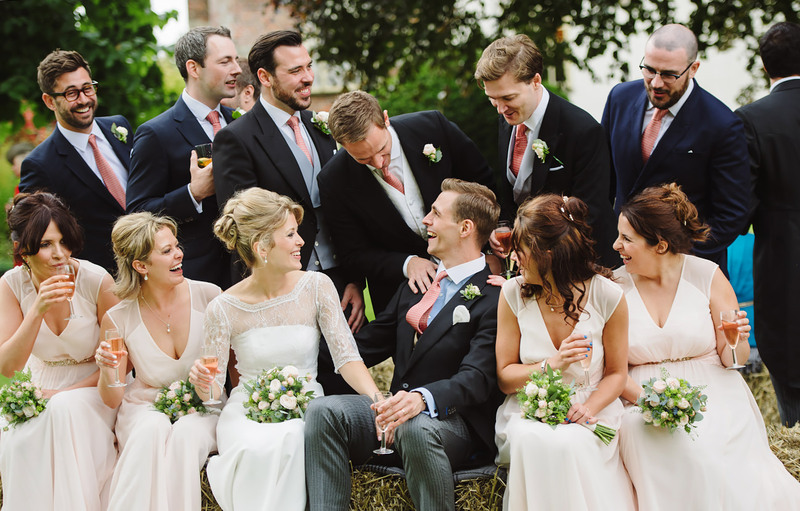 Make a list of your ‘must have’ Group Photos for your photographer and include as much detail as possible. Tell your families that you’d like them to be part of the photos and ask them to stay close to the main party while these are going on. If you’re not having many group photos make sure your guests are aware of this to avoid any confusion. Group Photos don’t have to be formal. It can be nice to mix them up a bit by using quirky locations, activities or incorporating them into other parts of the day so they don’t feel like hard work. There are some simple tricks your photographer can use to prompt these kinds of shots. Choose wisely, allocate enough time and have some extra help at hand. The best group photos happen when you and your guests are feeling happy and cheerful so keep them short and sweet to keep everybody smiling.